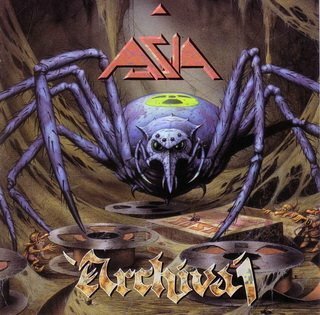 In addition to Asia's Arena album, during the 1996-1997 period Asia released three compilations, four live albums, and one single. That's nine different titles. If you were an Asia fan, these were big times indeed. Unfortunately the sheer volume of releases overwhelmed whatever concept of quality the band (or maybe record execs) had. Archiva 1 is as its name implies, the first of two archival collections of outtakes and unreleased material from the Payne era of Asia. As one might expect with such collections, it's usually a mixed bag. After all, there were good reasons why these didn't make it onto their corresponding studio albums. With this collection it became quite apparent to me as I just found one track after another giving me the urge to press that skip button. The quality of these songs, in both composition and performance is substandard for the quality AOR recordings Asia was well known for. Forget the progressive rock. There were only slight hints on their studio albums. Here it is entirely absent. I think the fact that the only songs I think are pleasing to my ears are the two very short instrumentals (The Mariner's Dream and Ginger) says volumes about how poor this release was. The other problem I have with Archiva 1 is that it wasn't released with Archiva 2 as a single 2-CD set. By issuing these individually, it costs the consumer more money. And for what you were getting, at best I would consider it a rip-off. Other than the two instrumentals, the only other interest it gave me was the historical liner notes. Only for Asia fans. Not worth the bother if you aren't one. Two stars.